KIEV, Ukraine -- Ukraine's glamorous former prime minister is slamming a new government dress code as "laughable." Yulia Tymoshenko, known for lacy dresses and stilettos, said Wednesday that the dress code would prevent the Queen of England from entering Cabinet premises. 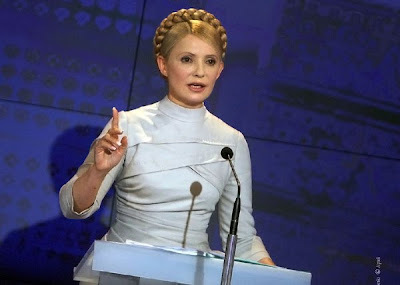 "The Queen of England and (Libya's leader Muammar) Gaddafi, for instance, for sure would not have been allowed in the Cabinet," Tymoshenko, who is now a top opposition leader, quipped at a news conference Wednesday. The code adopted this week calls on men working at the Cabinet of Ministers to wear mostly gray and dark blue suits and not wear the same suit to work two days in a row. Women are asked to stick to business suits and low-heeled shoes, and refrain from excessive makeup and jewelry. Tymoshenko's stylish outfits and traditional Ukrainian braid have earned her a reputation as a glamour and fashion icon, but also angered some Ukrainians as too luxurious at a time when the country is battered by a severe economic crisis. Some observers noted that a new dress code was overdue for government offices and other institutions in Ukraine, where women often wear tight, low-cut dresses to work while men are often seen in the same outfit for days in a row. But Anna German, a top aide to President Viktor Yanukovych, known as another fashionista among the political elite, disagreed. "A dress code looks archaic," German told Interfax news agency as saying Tuesday, adding that government workers should have a built-in sense of style and ethics. "I look at it with irony," she was quoted as saying.